NEW ORLEANS – Paige Lawler and Dhruvil Patel are champions both on the cross country course and in the classroom. That’s why they were named the NCAA Division III Cross Country Scholar Athletes of the Year on Thursday by the U.S. Track & Field and Cross Country Coaches Association (USTFCCCA). There were 682 student-athletes who earned USTFCCCA All-Academic honors with women accounting for 56 percent of that total (382). No program had more total individuals honored than Johns Hopkins, which brought home a staggering 17 distinctions. Lawler is the first athlete from Washington (Mo.) to be named Scholar Athlete of the Year. She is also the second athlete from the University Athletic Association (UAA) to be honored in a row (Khia Kurtenbach of U of Chicago won it last year). It was a dream season for Lawler, who really turned on the jets when it mattered. Lawler finished runner-up at the KollegeTown Pre National Invitational, won the UAA Championships, finished second at the Midwest Region Championships and then won the individual title at the NCAA Championships by nearly four seconds. 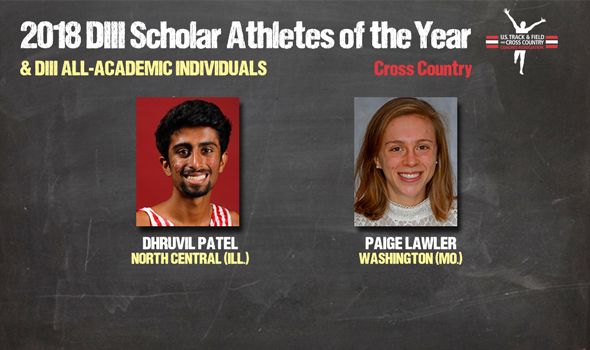 Patel is the first athlete in the storied history of North Central (Ill.) to be named Scholar Athlete of the Year. He is also the first athlete from the College Conference of Illinois and Wisconsin (CCIW) to earn this honor as well. There was nothing that could slow down Patel during the cross country season. Patel posted five victories and finished fourth at the Louisville Classic against a host of talented runners from NCAA Division I programs. Yet it was Patel’s winning effort at the NCAA Championships, where he won by five seconds that led him to this honor. See below for a full list of student-athletes honored by the USTFCCCA.